The offseason is winding down, and the Washington Capitals have had a quiet, but productive one. They’ve acquired Lars Eller, who should slot in as their third-line centre, and the additions of Brett Connolly and Brad Malone should fill out the bottom-six. 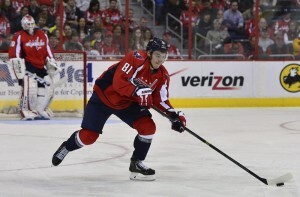 However, they have one piece of unfinished business, and that is re-signing defenseman Dmitry Orlov. 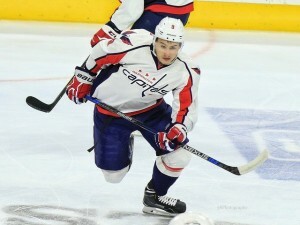 Orlov was drafted 55th overall in the 2009 NHL Entry Draft and was said to be one of the Capitals’ top defensive prospects. After battling through injuries and adversity, the 25-year-old made the jump from the Hershey Bears to a spot on the Capitals’ roster. Both sides are still in negotiations, but according to CSN, Washington is optimistic that the two parties will reach a deal. With six weeks to go until training camp, there is still plenty of time for the Capitals and Orlov to come to terms. Orlov’s last contract paid him $2.25 million, and as for his performance, he finished the 2015-16 campaign with 29 points (eight goals, 21 assists), along with a plus-8 and about 16 minutes average TOI per game. With only $3.45 million left in cap space, and Orlov wanting a pay raise, the Capitals cannot afford to overspend on Orlov. He skated bottom-pairing minutes, and as CSN’s Tarik El-Bashir pointed out, he should not earn more than Karl Alzner, who is getting paid $2.8 million on his current deal (which expires next year) and skates over 20 minutes per game. Therefore, with higher pay will come higher expectations for the Russian defenseman, and he will have to battle for a higher spot in the Capitals’ defensive corps. Orlov is expected to take over a bigger role, likely competing for a top-four spot with Karl Alzner. Orlov put up impressive numbers, posting a 4.2 relative Corsi, 5.5 hits per 60 and 1.32 points per 60. With these stats, he can become Washington’s number-four defender. While he did have an impressive season, his first one in which he played and dressed in all 82 games, he did have his flaws. He was finally benched and scratched when an error led to a critical goal against in the first game of the playoff series with Pittsburgh. Though Washington’s depth chart is a blessing, it is a curse for Orlov, who is competing for a promotion and a bigger role. Orlov shoots left and has to compete with Brooks Orpik for the left-hand slot in the top four. Orlov has massive upside and will be one of the Capitals’ best defensemen down the road. However, with this contract, he will have to make massive strides. When it comes to his salary, the Washington Post points out that due to Zach Sanford and Jakub Vrana looking to make their NHL debuts, their cap hits in the NHL and a possible 14th forward, Washington’s $3.45 million remaining turns into around $2.6 million left to sign Orlov. Overall, it seems like Orlov will get a modest raise, and it will likely be a short-term deal. In the meantime, Orlov’s agent has declined to comment on details of the negotiations.